ERA/FoEN in a statement issued in Lagos called the ruling a landmark judgment and a key victory setting a precedent for global environmental accountability that parent companies, often based in Europe or the United States, can be held accountable for environmental infractions committed by their subsidiaries anywhere in the world. In the suit, four farmers, supported by Friends of the Earth, dragged Shell to the Dutch court thousands of miles away from their communities in Nigeria, where Shell’s defective pipelines caused damage to their fishponds and farmlands in 2004, 2005 and 2008 respectively. Shell has consistently denied responsibility. It refused to clean-up the spill and did not pay compensation. The case, which has the Dutch environmental justice organization Milieudefensie as co-Plaintiff, was filed in 2008 and had passed through lots of legal hurdles ostensibly set up by Shell before getting to this point of judgment. While Royal Dutch Shell Plc had maintained that it could not be held responsible for the actions of its subsidiary in Nigeria, the subsidiary Shell Petroleum Development Company Nigeria Ltd had insisted that it cannot be tried by the court in the Hague for problems arising from Nigeria. But the Dutch judiciary in 2009 declared itself competent to try the case. 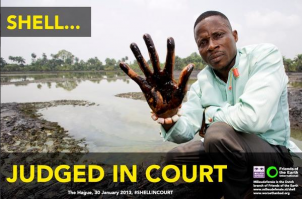 Last October, the Dutch court had a full trial of the case whereupon the judgment of today declaring that Shell Nigeria broke the law by not repairing leaks that destroyed the lands of the four farmers is based on. “Finding Shell guilty of the spill at Ikot Ada Udo is commendable. Their disdain for the wellbeing of communities that suffer the impacts of its reckless exploitation of oil in the Niger Delta has been legendary. The spill at Ikot Ada Udo lasted for months and in open farmland and yet Shell had the temerity to fight to avoid culpability. It is just and fair that it is held accountable for this crime,” said ERA/FoEN Executive Director, Nnimmo Bassey. Meanwhile, the Mother holding Shell has expressed satisfaction on the ruling, because the court concluded that in four out of five cases sabotage was the cause of the spill. Milieudefensie will appeal.